No musical experience is complete without an option to customize it to suit your mood, your musical tastes, or your interests. TuneIn is tuned into what consumers want out of its services and their latest feature improvement is a reflection of their commitment to providing the best customer experience. What feature you say? It’s called TuneIn Live, and it’s a feature that lets you customize TuneIn on the web or on your iPad. Let’s take a look at how TuneIn Live works. Remember, TuneIn Live services are currently available only on the TuneIn website and on the TuneIn app for iPad. Let’s check out TuneIn Live on the website. Open up the website and you’ll immediately see a likable interface with a trend board on the left and live tiles on the right with an edit button to customize the tiles. 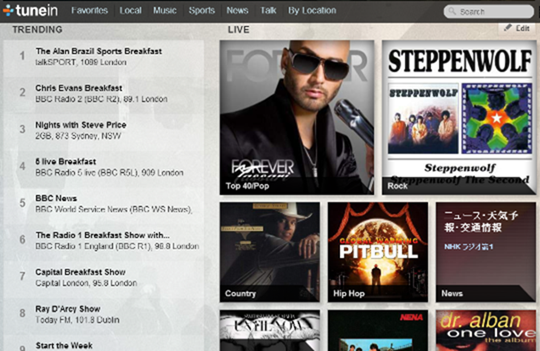 Click Edit and choose what tiles you want to see on your TuneIn website. 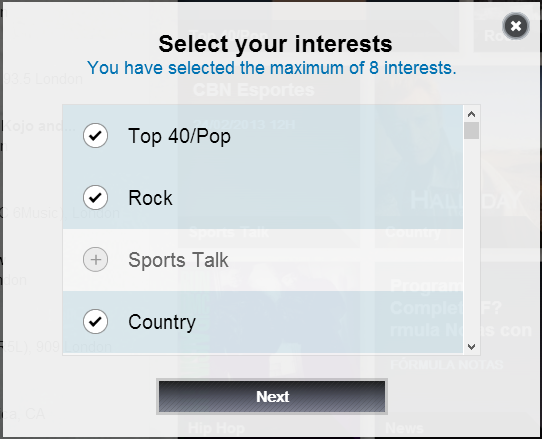 You’ll need to have a TuneIn account to customize and set up your preferences and that shouldn’t take long. You can also choose a social login (facebook or Google +) to create your tuneIn account. Once you’ve logged in, you can choose up to a maximum of 8 categories that are available on TuneIn radio. This can be anything from the 80’s music, Hip Hop music stations, News and comedy shows. Once you setup your preferences, the tiles will flip over to reflect the latest happenings in that category, whether it’s a song that’s playing, or an interview. If you’ve Tuned in before, you’ll know that sifting through its 70,000 odd radio stations for music you liked was a real pain. With TuneIn Live, you’ll have narrowed it down to much more easier choice. However, it still looks as though TuneIn has a long way to go in terms of giving people exactly what they want. How about listening to the tunes right from within the tiles? Although I love the cool flipping tiles, I’d like to listen to the channels right from my home page, while the tiles flip through. That way I can get to shift stations playing my favorite songs while on the Home page itself. So much for having the cake and eating it too! Have you tried the new TuneIn Live feature? Tell us what you think.